Hero Histories: Dinosaurs + Cowboys = Christmas FUN! They just don't make comics like this anymore! 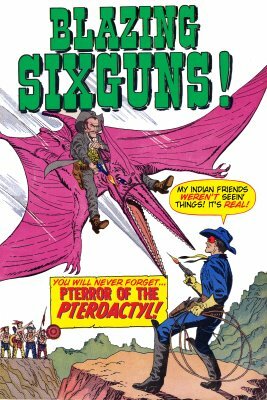 Masked cowboy hero vs gunslinger riding a pterodactyl...and a bright magenta pterodactyl at that! It's the sort of concept a nine-year old would come up with while playing with his (or her) brand new action figures under the Christmas tree, mixing the dinosaurs with superheroes and cowboys! That's what makes it so KOOL! It's so darn silly you just have to look at it and think "what the--?" That's exactly the sense of wonder we at Atomic Kommie Comics™ still feel! We want to live in a world where anything can, and does, happen! In pop culture, we call this "cross-genre", where a story draws elements from disparate categories of fiction. Sometimes there's a certain logic to it. One of my favorite books involves fiction's greatest detective dealing with the first alien invasion! Since he lived in London at the time the invasion took place, it seems only (dare I say it) elementary, that Sherlock Holmes would witness and analyze the Martian invasion of 1898! That's the basis of Sherlock Holmes' War of the Worlds by Manly Wade Wellman & Wade Wellman! That, to us, defines KOOL! Track down a copy. If you're a Holmes, Challenger, and/or War of the Worlds fan (I'm all three), it's well worth the effort! Sometimes there's no real logic to it except--"why not?" That's the category where Santa Claus Conquers the Martians goes! And that's where the cover shown above goes. This particular design was so cross-genre we put it in three different sections--Dinosaurs!, Masked Western Heroes, and Tykes, Toddlers & Tiny Tots (and Their Mommies)!™ because, hey, it fits in each of those categories, so--"why not?" Keep the Sense of Wonder alive! Give a gift that keeps inspiring the imaginations of both the young and the young-at-heart! Stick a present from Atomic Kommie Comics™ into a stocking or under the tree!